Editor’s Note: this is a piece emailed to me by a long-time reader, who knows a lot about the sport from an analytical perspective, as well as from a more personal angle. I used to go to Paris every year with my family earlier on when our kids were still teenagers. It’s a very nice city to visit, not too far away from where we live, and we enjoy celebrating the Asian New Year there in the 13 department of Paris between ‘la place d’Italie’ and ‘la Porte d’Yvry’. Those who know the city a little bit know that this ‘Porte d’Yvry’ is pretty close to the “Porte de Bercy’. Porte d’Yvry and Porte de Bercy follow each other when you travel by a car on the eastern part of the Boulevard Périférique, the ring around the city of Paris. 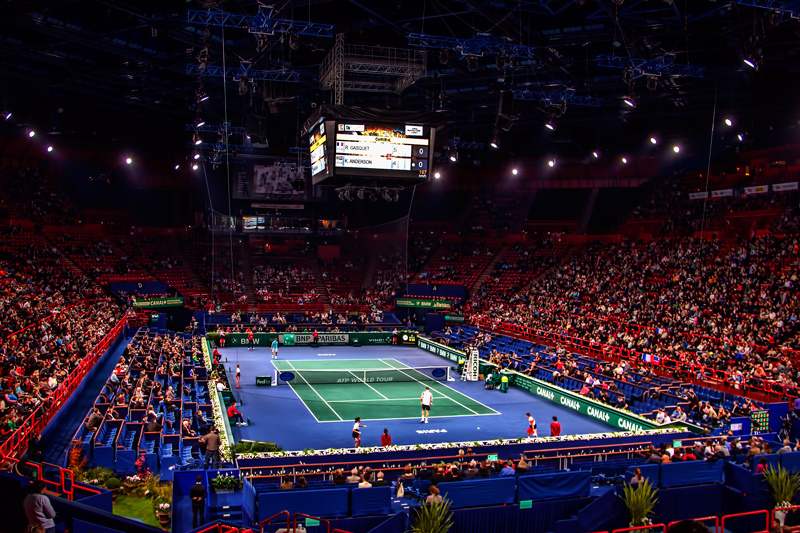 At Paris- Bercy, the last Master of the season takes place on an indoor hard court. Some top tennis players have an apparent love affair with this tournament and every year they show up there to give it their best. Djokovic is the best example of such a real relationship of love for the event. Since 2005, Novak has been present in this event every year without exception, and he won it four times in the process (2009, 2013-15). This season he unfortunately had to abandon because of injury; if not, he would have played. Next in line comes Murray who likes to play this event as well. He won it last year in 2016 season, played the finals in 2015, the QF’s in 2014 and played it every year since he first participated in November 2006, with only one exception: the 2013 season; that year he won Wimbledon, but lost in the U.S. Open – QF’s and then only played Davis Cup, and withdrew from Shangai, Paris and the World Tour Finals. What about the other two of the so called big four, Federer and Nadal? Well, to be honest, their love for the Paris hard courts of Bercy seems ambiguous. Federer didn’t play in 2004-2006, 2012, 2015 and this season he withdraws again. It seems like every time he wins a slam or more, he skips Paris and goes straight to the World Tour Finals. In Paris they can’t be really happy with that of course. Nadal is another peculiar case. He has been more absent in Paris than present (played only 5 times prior to this season), and when present possibly hasn’t given his best: for illustrative purposes, he lost in straight sets from Wawrinka in the Paris 2015 QF’s (in two tie breaks), but ran all over him two weeks later in the RR of the World Tour Finals (6-2 and 6-3). What about other top players, such as Cilic, for instance? Cilic plays in Paris every year, with one exception: the 2014 season. In 2014 he won his first slam title, at Flushing Meadows, and jumps then from the 16th place in the rankings to the 9th spot. Two months later, in the meantime 8th in the rankings, he wins another title (ATP 250 Moscow), but falls back to the 9th spot in the race, nevertheless, one spot behind those who qualify for the World Tour Finals. However, Cilic could care less about his ranking, and why not, as he benefits from the rule that anyone who has won a slam and doesn’t belong to the top 7 of the Emirates ATP rankings at the end of season, does qualify for the World Tour Finals at spot 8. So Cilic decides to skip Paris, and concentrate on the WTF’s. This summary shows you that some top players treat Paris-Bercy correctly while others don’t shy away of skipping it for personal reasons. Paris is Burning. . . (A Big Post Coming)! Great post wilfried; thanks. In federer’s defense I guess if he didn’t play Basel every year we’d see more of him in Paris. 3 tournaments close together at the end of the year is too much if you’re expecting to go deep in all 3; so something’s got to give. You don’t want to skip the WTF. There are more points to be gained in Paris but roger has a sentimental/patriotic attachment to Basel. I suppose he feels he owes it to the swiss fans. It’s a personal decision but not exactly a selfish one. If I wanted to pin the blame on someone I’d point to the all those players who lack the game and the guts to challenge the big 3/4/5, meaning that the top guys go deep in most tournaments they enter and therefore can’t enter every tournament. Thanks for reading commenting on the article,clint grike. I realize my judgment on the commitment of some top players for the event at Paris-Bercy may have been a bit too harsh. After all we’re not in their shoes, not in their body, and can’t know how they really feel when having to take a decision whether or not to participate at a certain tournament. But in some cases I certainly have my doubts about it, and I think it is sometimes partly mental. « 1) If a player, qualified for the ATP World Tour Finals as a direct acceptance or designated as the alternate, fails or refuses to participate in this event, except for bona fide injury or other reason which constitutes good cause, the player shall not be in good standing. 2) All direct acceptances and the alternate must appear at the site of the event(s) as determined by ATP and participate in the pre-tournament media conference. Failure to appear shall result in a penalty of five percent (5%) of total ATP prize money earned during the ATP circuit year. Tomas Berdych, Jo-Wilfried Tsonga and Nick Kyrgios refused to go to the championships as an alternate last year (only reason why David Goffin could go to London). This season Del Potro told the press he won’t go to London as first or second alternate either; he wants to rest, which he sure wouldn’t have done, if he had won his match against John Isner. This tell us perhaps more about the lack of meaning of ‘playing’ as an alternate in the WTF’s than anything else. Thanks. yeah good point about ‘playing’ as an alternate. That’s a weird position to be in. To have to go there and sit through the presser when you haven’t earned your place and probably won’t be playing…. I can understand how a player’s competitive pride would make that difficult. But those who’ve made the top 8 shouldn’t shirk the WTF. That’s why I give fed a bit of a pass for skipping Paris-Bercy. Because the WTF has a special importance as the finale to the season. We want to see the top guys settle some issues and some scores. I really like the idea of the WTF but it robs the tournament of its rationale if players don’t take it seriously or chicken out. Matt has something to say above about Rafa’s potential absence I see…. Working on that next installment today where I qualify 2017 (as good as it was, the “cupboards were pretty bare,” so to speak). 2017 Fedal got away with the crown jewels and here at the end, Nadal, especially if he bows-out of WTF, which he almost certainly is, looks to be really getting away with something. Or is he? Historically, the WTF (or the tour’s earlier version of this season finale) is big. Ask the non-Nadal crowd about his legacy and they’ll point to the clay and the lack of even a single WTF title. The boys on top of that list are Federer, Sampras, Lendl and Djokovic – the usual suspects. Good stuff, Wilfried. The right knee I’m sure just got an extra wrap!